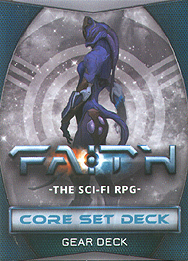 The Gear Deck is a deck of cards for Faith: The Sci-Fi RPG with 54 unique gear cards for the players designed to enrich the experience of the game. Faith: The Sci-Fi RPG is an RPG that uses board game tools such as cards to enhance the experience of play and put the art on the table. Create your character and five amazing adventures across the rich universe of Faith, be part of the war of the Gods and become key to the unfolding of the Universe destiny.